The hall was crowded. I sat at a table with a group of young guys from Engine 42. Sitting next to me was a kid I helped train when he first came on the job. He was now a Fire captain with a reputation as a great Firefighter. He will always be a young guy to me. We talked about the old days and the many fires we fought during our careers. We were there to honor Senior Chief Mark Lafferty who was retiring after 37 years of service. The captain leaned over and said, "This room is like a Firefighters Hall of Fame." Looking around the room I realized he was right. The men and women attending this retirement party were the best Firefighters in the world. A true tribute to Senior Chief Mark Lafferty. These men were not only good Firefighters they were exceptional people to boot. Many had served as union reps or Firemen Fund trustees. Even the former head of the Police Sergeants and Lieutenants Union, John Storm, was there. We were all present to honor a man who never lost his youth, who never let his running mates down, and was always a part of causes that helped Detroit Firefighters. From day one on the job Mark Lafferty was a good Firefighter. He ran on a squad and that speaks to his dedication. He became a pension trustee and followed the path set by Harry Manual. A path of excellence and integrity. Mark took integrity to a new level. While sitting on the pension board he became a union rep. His progression in the union took him from battalion director to treasurer, to vice president, then to the top as President of Local 344 The Detroit Fire Fighters Association. He protected our promotional system and kept it from the clutches of the political jackals who view it as a money pool for electing people to office. 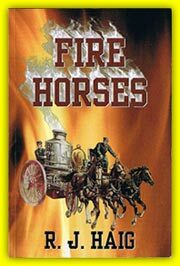 He was highly involved in saving fire companies from being closed. He worked hard to add six sergeants positions at a time when other unions were losing positions. He was smart enough to back Dennis Archer when he ran for mayor. It was the first time Local 344 supported a winner in 50 years. It paid big dividends for Mark’s Firefighters. One of the best things he did was to help establish a camp for children who were severely scarred from fire burns. During his time on the job he became a member of the clown team. The clowns spent many hours at hospitals entertaining sick children. There were many presentations and many words spoken about what a great person Chief Lafferty was during his thirty seven year career, He will fade into retirement like a lot of us do but Mark will leave an after glow because of the impact he made on The Detroit Fire Department. He was one of a kind and we wish him well. The picture you see following this article says it all. 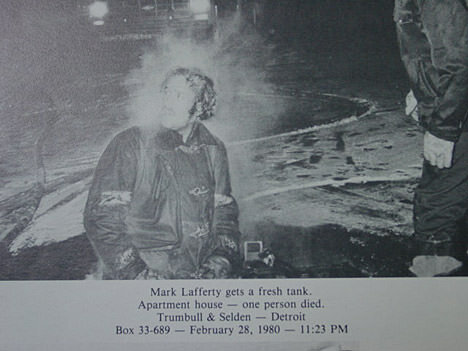 Mark Lafferty is a Hall of Fame Firefighter.